Isn’t this thing just cute? 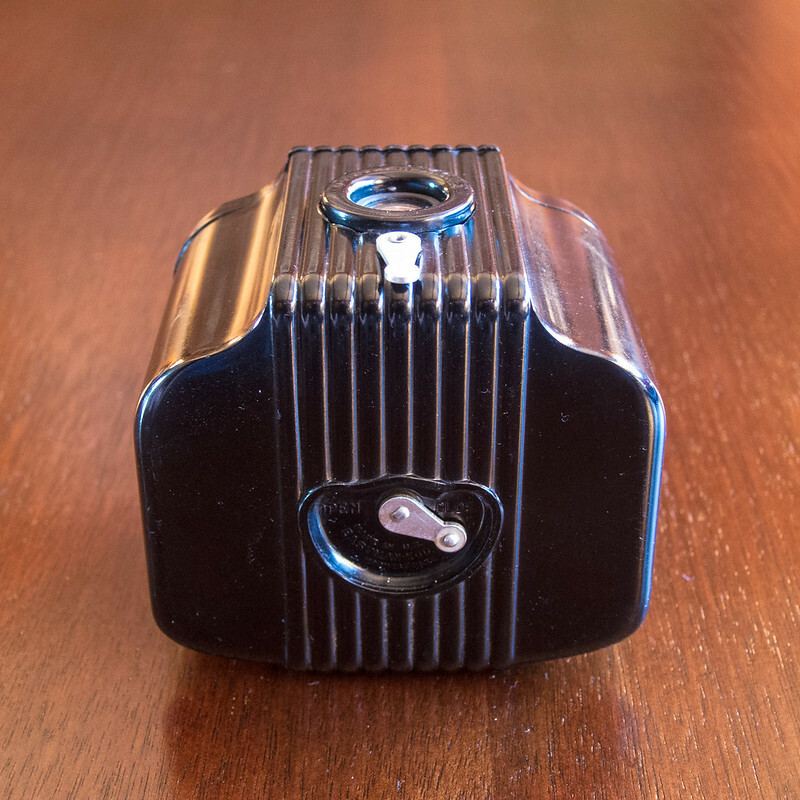 Made of Bakelite and aluminum, this palm-sized box camera from the late 1930s is almost certainly the smallest ever made to accept 127 film. I’ve shot this camera but once. 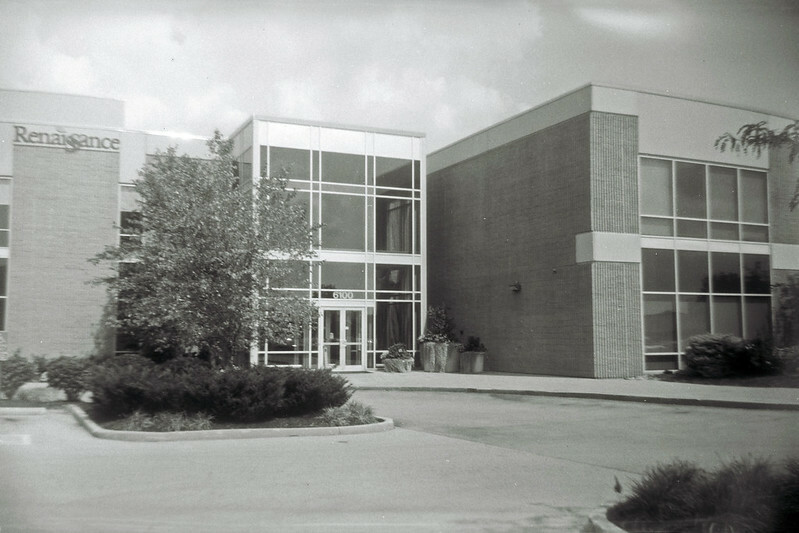 I put my last roll of Efke 100 through it. I wasn’t wowed with the results. The lens might have been dirty; that’s been a common problem with old boxes I’ve encountered. So before shooting it this time I swabbed it clean with rubbing alcohol. Or it could just be that I don’t like the look of Efke 100. This shot of my last house was by far the best of that roll. So this time I shot Ektar, which in my experience is the best film for testing an old box. Such cameras tend to operate at 1/50 sec. at f/8, or 1/40 sec at f/11, or some other similar aperture/shutter-speed combo. 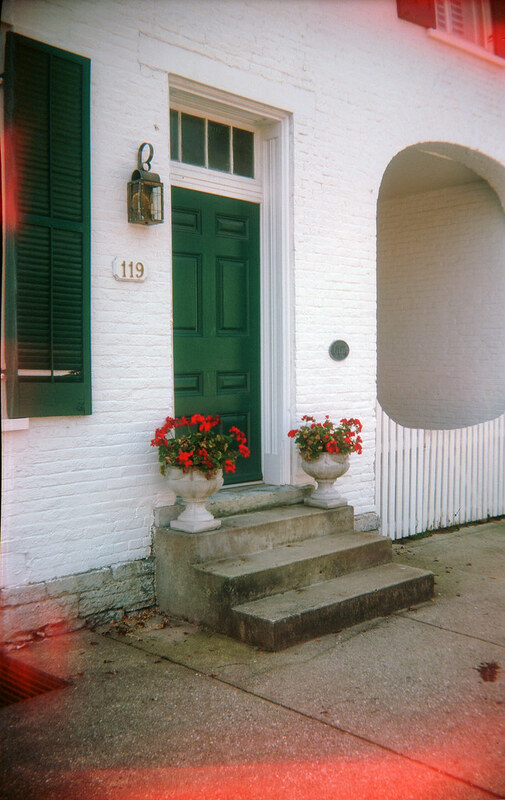 On a sunny day, ISO 100 film is a good fit. 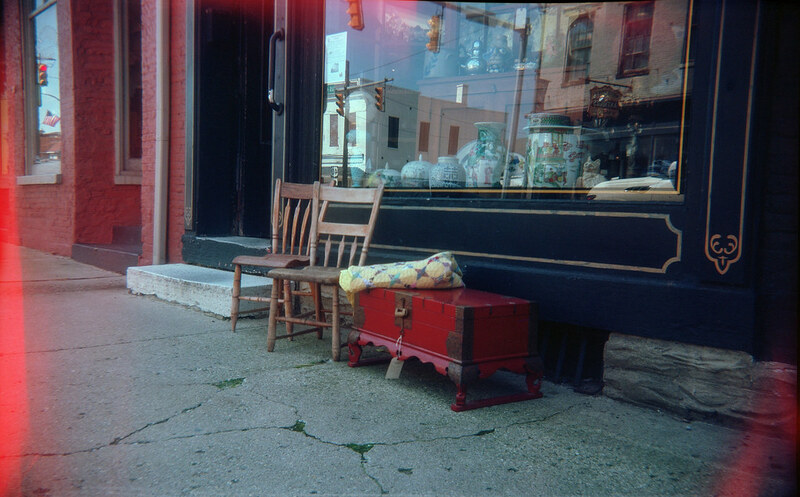 Ektar in particular has wide enough exposure latitude to make up for unsunny days and exposure vagaries from box to box. 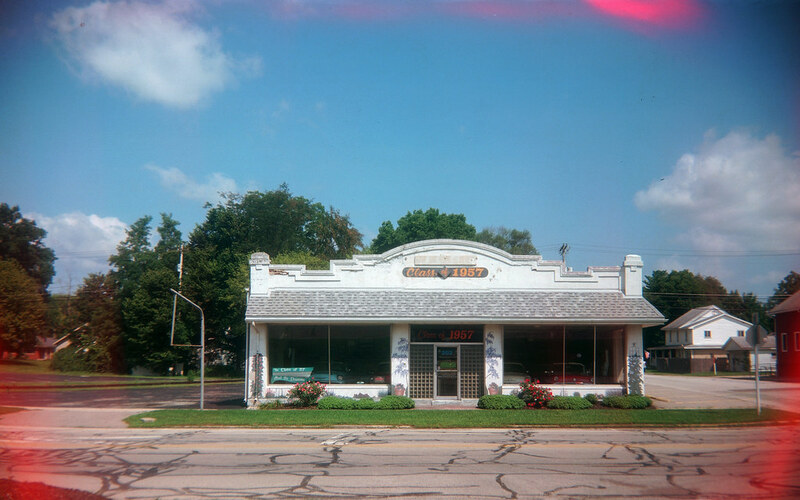 Kodak doesn’t make Ektar or any other film in 127; nobody does. But I found a fellow on eBay who cuts various 120 films down to 127’s width and respools the stuff onto 127 spools. His film flowed flawlessly through my Baby Brownie. As you can see, however, light leaked everywhere onto these frames. There was evidence of leaking light on my Efke 100 roll but not as strong as here. Given the hand-rolled nature of the film I can’t be sure something wasn’t perfect with the way the film was rolled, either. But I’m betting it’s the Brownie. This is such a wonderful little camera to use. Pop up the viewfinder, frame, and slide the shutter lever. You get used to its front-and-center placement in no time, and it moves easily. Shooting at close range, however, you can see this simple lens’s tendency toward barrel distortion. I brought the Baby Brownie onto the National Road in eastern Indiana in August; these photos are from Centerville and Knightstown, Indiana. 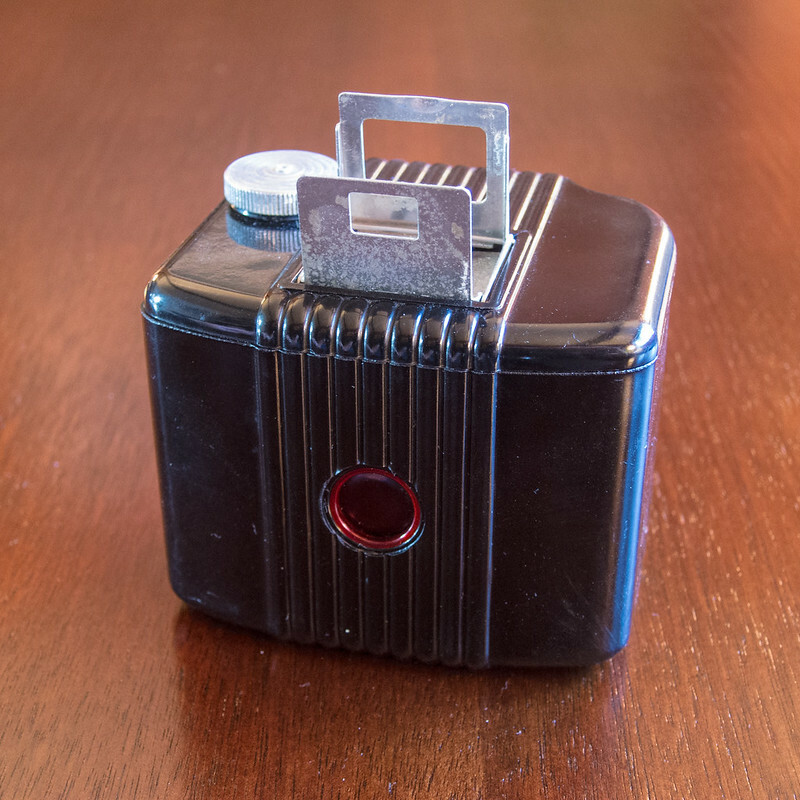 To see more from this little box, check out my Kodak Baby Brownie gallery. Even though my Baby Brownie outing was pleasant, I’m not that likely to shoot very much 127 going forward. If I do, I know I’ll always get out my Kodak Brownie Starmatic. It’s even more pleasant to use, its lens is better, and it leaks considerably less light (as you’ll see in an upcoming Operation Thin the Herd review). I briefly considered keeping the Baby Brownie for display, but in the end decided it’s time to let it find its next owner. It’s just so cute. And it fits into the palm of your hand. 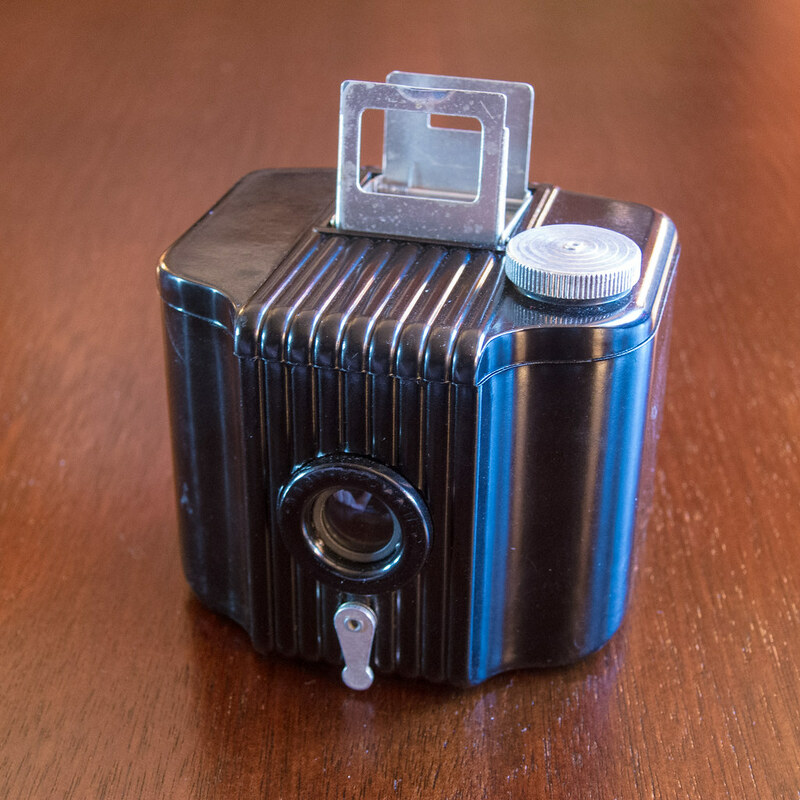 Meet the tiny Kodak Baby Brownie. 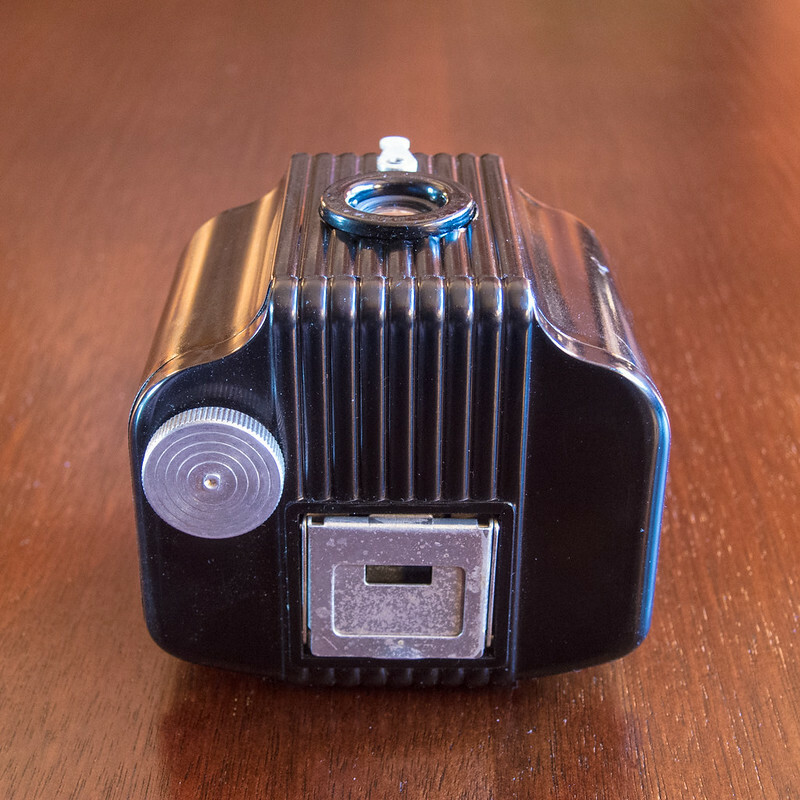 Produced from 1934 to 1941 in the United States and from 1948 to 1952 in the United Kingdom, the Baby Brownie is about as simple as a camera can be. Made of Bakelite, it features a glass meniscus (single-element) lens and a rotary shutter. I’d bet that this combo is something like f/11 at 1/40 sec., or maybe f/8 at 1/60, or f/16 at 1/30, so the camera can capture a usable image outdoors under most lighting conditions. The Baby Brownie produces eight 4×6 photographs on 127 roll film. To take photos, you pop up the viewfinder, frame the scene, and then slide the lever under the lens to the left to fire the shutter. The lever springs back. Wind the film to the next frame right away so you don’t forget, because nothing about this camera prevents double exposure. 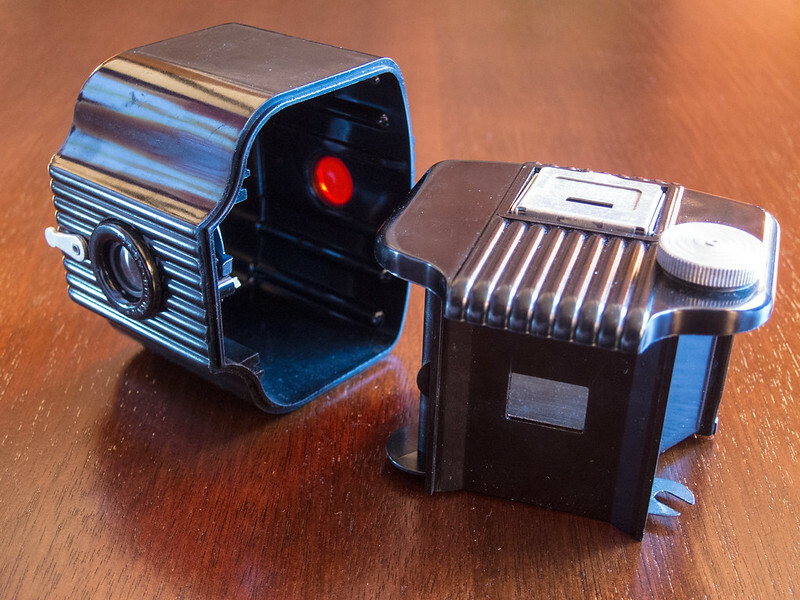 Noted industrial designer Walter Teague designed this clever little camera. Perhaps it was a reflection of the time, but much of his work reflected streamlined and art-moderne sensibilities. But his designs were also practical and functional. To wit, on the Baby Brownie, the lever on the bottom separates the camera so you can load film. The spool clips are up front; you thread the film around the back. When new, the Baby Brownie cost just $1. That’s equivalent to about $18 today. I checked Amazon, by the way, and you can get a new digital camera for under $20. But the reviews say you won’t like it very much — faulty software and lousy image quality. And none of those cameras are made by a company you’d recognize, let alone the number one consumer camera maker in the world. I’m on a jag to use up the oldest films in my fridge. That’s why I bought this camera — my final roll of Efke 100 in 127 size had been in there for a couple years and it was past time to shoot it. 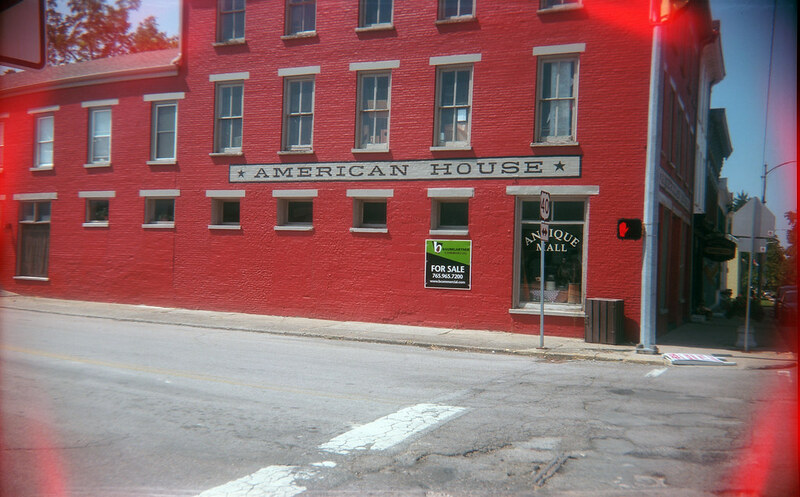 I could have shot this roll in my Kodak Brownie Starmatic, but I’d done that before and wasn’t excited about the results. I was a little happier with the photos I got back from the Baby Brownie. They had pretty good clarity and detail. The Baby Brownie delivers considerable softness and distortion in the corners, however, but that’s pretty normal for such a simple camera. It also probably didn’t matter when this camera was new, as it was advertised as making 1 5/8 x 2 1/2 inch prints — essentially contact prints off the negatives. Here’s the building I work in. Fans of the show Parks and Recreation might recognize it as the Gryzzl building. I kind of wish I hadn’t used the whole roll taking landscape and architectural shots, and had gathered a couple friends to shoot them from about 10 or 15 feet away. I’ll bet that’s the kind of photograph this camera was made for. All of the 127 cameras I ever shot delivered square photos. It was novel to get 4×6 photos from the Baby Brownie. But the pop-up viewfinder shows considerably less than what the camera sees. 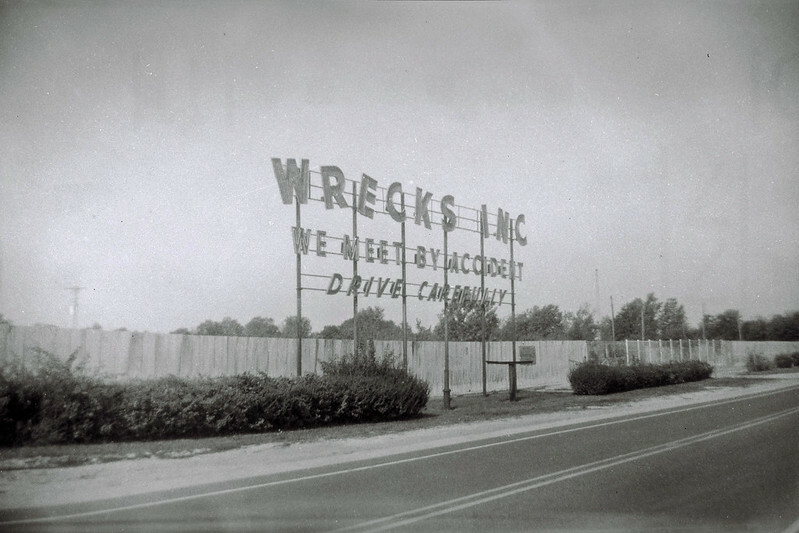 When I framed this shot, the Wrecks sign filled much, much more of the frame. 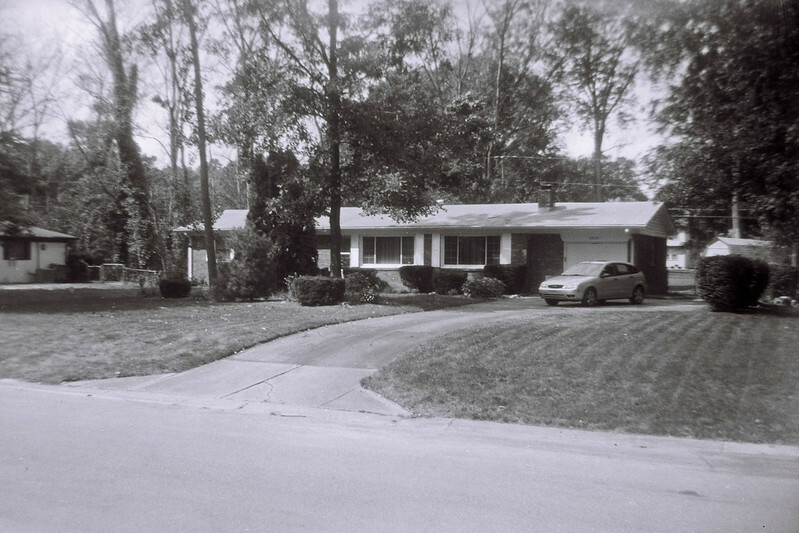 The photo above of my house filled the viewfinder from left to right. If I shoot the Baby Brownie again, I’ll choose subjects 10 to 15 feet away and see how it behaves. I’m betting Kodak designed this camera to favor family photos rather than landscapes. When I next shoot this Baby Brownie, I’ll cover the red window with black electrical tape. In the shot above, you can just make out the frame numbers printed on the film’s backing paper. 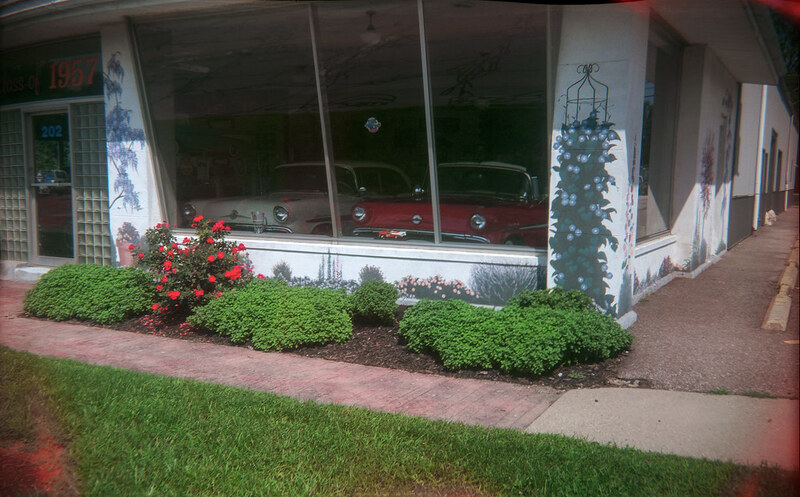 This was much more pronounced on one other shot from the roll. 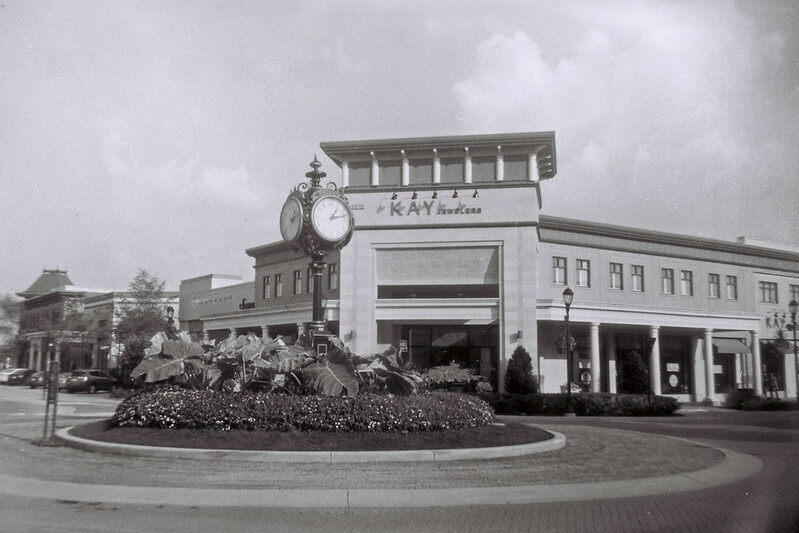 To see more photos from this roll, check out my Kodak Baby Brownie gallery. Everything about using this Baby Brownie was a delight and a pleasure, starting with when I first held it in my hands. I couldn’t get over how small it was! And then it was so easy to carry with me. I even found the shutter lever to be intuitive and easy, despite its unusual left-right action and placement under the lens. I’d like to shoot this camera again. But even though Efke stopped making film a few years ago, all is not lost: as of 2015, a few 127 films are available. You can buy Ilford HP5 Plus cut down from 120 and hand spooled at B&H Photo. Or you can buy one of the three newish films specially made in 127: an ISO 100 black-and-white film called Rera Pan, available at B&H and at Freestyle, as well as color films at ISO 160 and 400 called Bluefire Murano, available from Frugal Photographer. These films are all pricey a bit north of $10 a roll, but that they are available at all today is remarkable.